Nicole: Who R U Picking? This is going to be a good fight to LOOK at tonight. While at Sprint yesterday waiting on my new blackberry, their weigh in was showing. Everyone stopped, the store got silent and we all stared at the TV screen. At the end, a customer gave me a tissue; he said I was drooling. LOL. It was nice to SEE these Boxers get on the scale in their boxers. I'm still trying to find a fight party to crash. 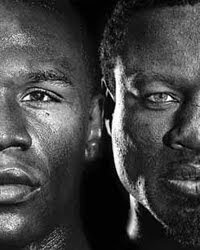 My coins are on Mosley only cause Mayweather full ah big chat.